Completed Grade 5 Piano from Trinity College London. He is now preparing for Grade 8 Piano. 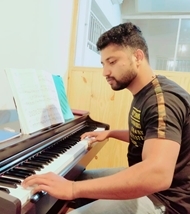 Teaching Keyboard, Piano, Vocal, Choir in different Institutes and Academies in Bangalore. He plays different instrument and perform for many corporate shows. Conducts choirs in different church and schools.